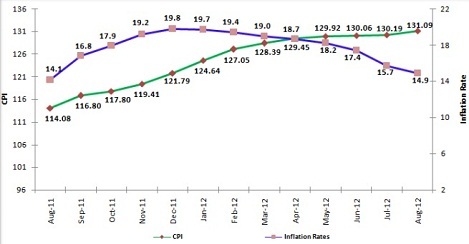 According to the Tanzania National Bureau of Statistic the Annual Headline Inflation Rate for the month of August 2012 has declined to 14.9% compared to 15.7% recorded in July 2012. The decrease of Annual Headline Inflation Rate for the month of August, 2012 explains that, the speed of price increase for commodities in August, 2012 has further decreased compared to the speed recorded in July, 2012. However, the overall index went up to 131.09 in August, 2012 from 114.08 recorded in August, 2011. Food and non-alcoholic beverages Inflation Rate, which accounts for 47.8 percent of the basket of goods used to measure inflation, has decreased to 18.8% in August 2012 from 20.8 % recorded in July, 2012. Annual Inflation Rate for food consumed at home and away from home has declined to 18.5% in August, 2012 as compared to 20.3% in July, 2012. However, the 12 month index change for non-food products has slightly increased to 10.3% in August, 2012 compared to 10.0% recorded in July, 2012. The inflation rate is expected to keep slowing in coming months, helped by abundant food supplies.